Use our resources to better understand urban geography. 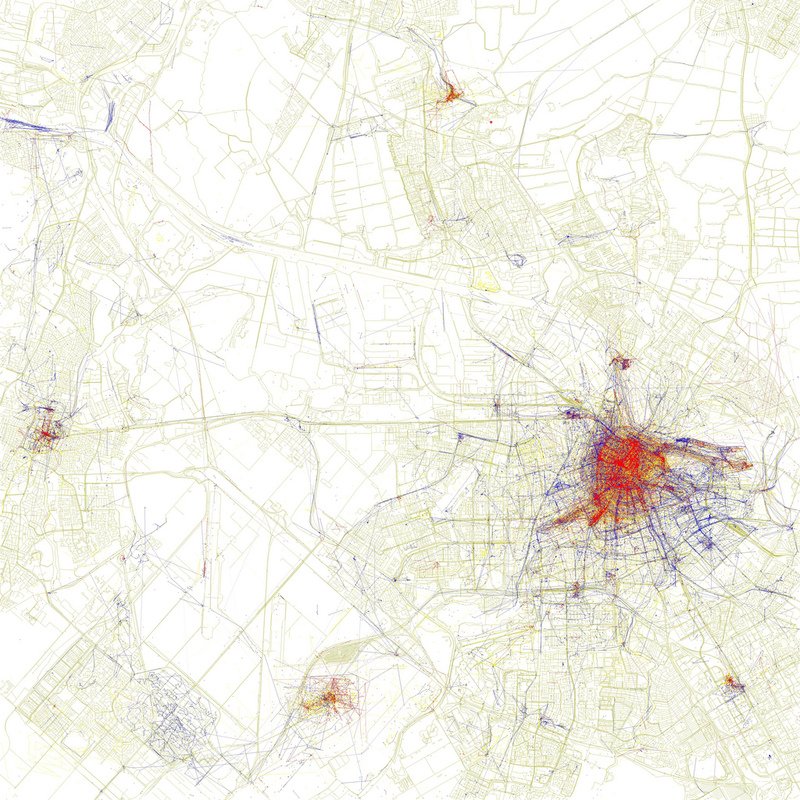 Take a look at some maps of global tourist destinations. (Note there are two pages!) Red indicates photos taken by tourists. Blue indicates photos taken by locals. 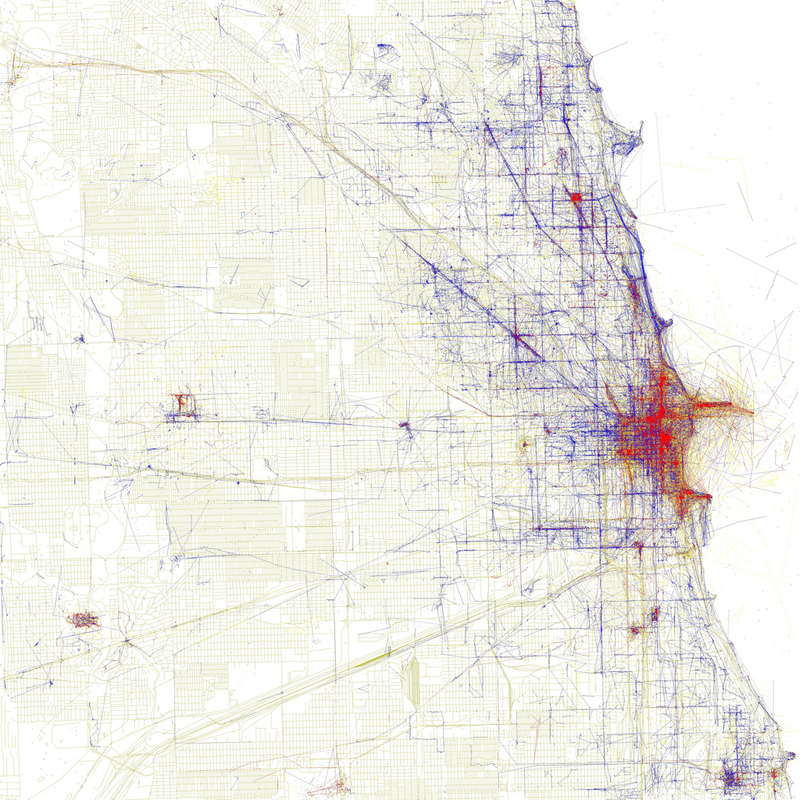 (So dark purple areas indicate heavy overlap between tourists and locals.) Yellow indicates photos that could have been taken by either a resident or a tourist. 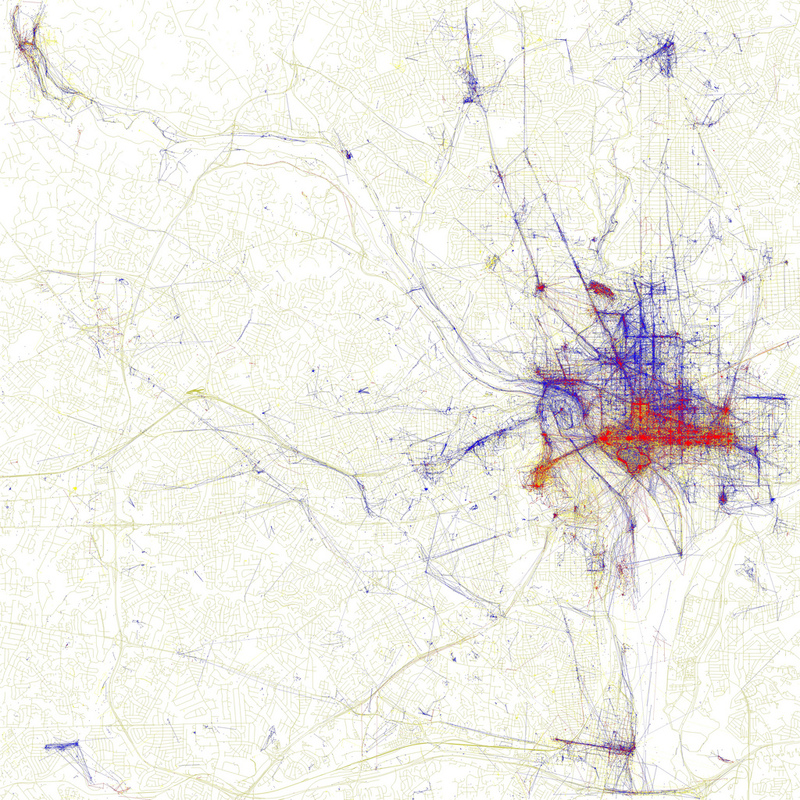 Where do you think tourists are taking pictures in these cities? That lovely red rectangle corresponds almost exactly to the National Mall, with the Lincoln Memorial to the west end and the U.S. Capitol to the east. In between, the Mall is lined by the National Gallery of Art and museums of the Smithsonian Institution. The red rectangle darting northward roughly corresponds to the White House, while the trefoil-shaped path to the south is the Tidal Basin, home of the Jefferson Memorial (and cherry blossoms!). 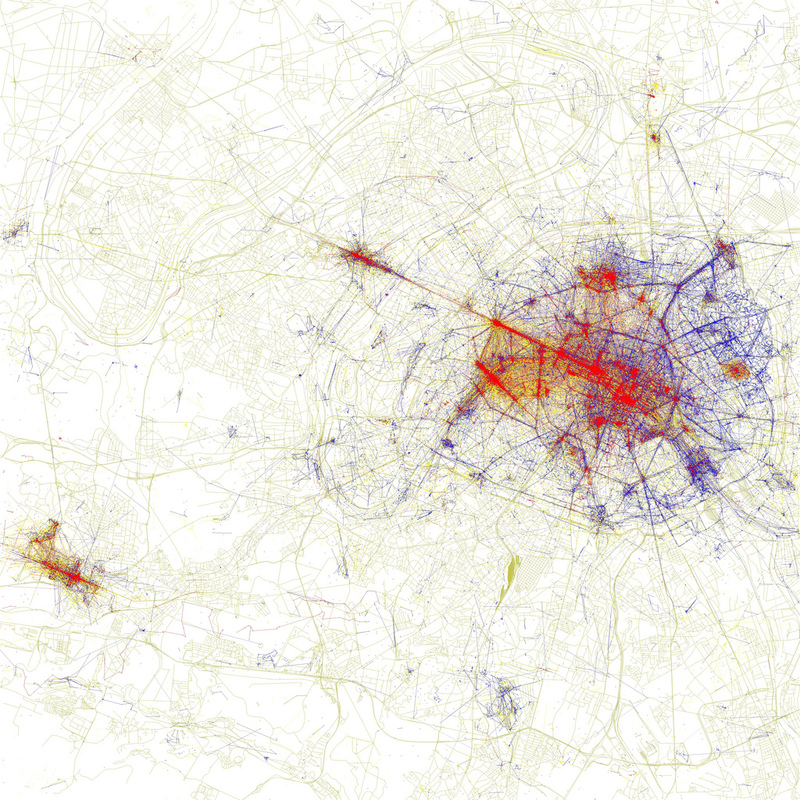 The red areas in downtown Paris include Notre Dame Cathedral (one of the more southeasterly red blobs), and the long red line known as the “Axe Historique,” which includes the Louvre Museum, the Tuileries gardens, the Arc de Triomphe, the Champs Elysees, and the big modern arch at La Defense. The red blob to the north probably represents visitors at the beautiful Sacre Coeur basilica. The island of tourism to the southwest probably indicates visitors at the Versailles palace complex. The red line running along Michigan Avenue is Chicago’s famous “Magnificent Mile,” which is part of the city’s “Loop” business district. The Magnificent Mile includes elite retail shops, hotels, and five of the 85 tallest buildings in the world. Jutting into Lake Michigan is the tourist-friendly Navy Pier. Tourist-red almost exactly outlines Amsterdam’s U-shaped series of canals. Between the canals are the Rijksmuseum, the Anne Frank House, the Maritime Museum, and the city’s famous “red light” district. The island of tourism to the west of the city is probably the nearby town of Haarlem, famous for its tulip fields. Orlando is the home of some of the world’s biggest theme parks. That’s Universal Studios Orlando to the north, Sea World due south of Universal, and the Disney complex to the southwest: the Magic Kingdom, Epcot (with the circle), Disney’s Hollywood Studios, and Disney’s Animal Kingdom. Now click through the cities in this gallery. What do they have in common? Why? All these cities seem to have no locals taking photos! The absence of local photos might be due to the fact that these are urban areas with highly concentrated business districts. Most residents would likely be working downtown, with little time or inclination to snap photos. The cartographer gathered his information solely from geotagged Flickr images. There is a good chance that many local residents are simply not uploading their everyday personal or family photos to Flickr. Take a look at the entire gallery of photos here. (Note that there are two pages!) What are some cities where tourists and residents are taking photos in the same areas? These are just examples. There are a lot more than five! What are some cities where there is very little overlap in areas where tourists and locals take photos?